North Korea, Brink of Disaster! North Korea Is Very Unpredictable! North Korea is again on the brink of war, and potentially a major disaster. Just slightly smaller than Mississippi and bordering China, South Korea, and Russia, the mountainous interior is isolated and sparsely populated, and has a population of over 24 million people. Following World War II, Korea was split with the northern half coming under Soviet-sponsored Communist control. After failing in the Korean War (1950-53) to conquer the US-backed Republic of Korea (ROK) in the southern portion by force, North Korea (DPRK), under its founder President KIM Il Sung, adopted a policy of ostensible diplomatic and economic "self-reliance" as a check against outside influence. North Korea has demonized the US as the ultimate threat to its social system through state-funded propaganda, and molded political, economic, and military policies around the core ideological objective of eventual unification of Korea under Pyongyang's control. KIM Il Sung's son, KIM Jong Il, was officially designated as his father's successor in 1980, assuming a growing political and managerial role until the elder KIM's death in 1994. KIM Jong Un was publicly unveiled as his father's successor in September 2010. Following KIM Jong Il's death in December 2011, the regime began to take actions to transfer power to Kim Jong Un who has now assumed many his father's former titles and duties. After decades of economic mismanagement and resource misallocation, since the mid-1990s North Korea has relied heavily on international aid to feed its population. The DPRK began to ease restrictions to allow semi-private markets, starting in 2002, but then sought to roll back the scale of economic reforms in 2005 and 2009. North Korea has a history of regional military provocations, proliferation of military-related items, long-range missile development, supporting unstable nations, and WMD programs including tests of nuclear devices. They also have developed long-range missiles capable of reaching targets in Japan and U.S. bases in Guam, Okinawa and the Japanese mainland. North Korea’s massive but poorly trained and equipped military, ranked fourth largest in the world, could cause significant damage in the early stages of an attack on its southern neighbor. But any attack would ultimately be repulsed by superior U.S. and South Korean forces, military analysts agree. Analysts say North Korea’s aging military would not be able to prevail long term in an attack against its southern neighbor. But North Korean forces are arrayed along the demilitarized zone with 10,000 artillery pieces capable of reaching Seoul, said Bruce Klingner, a former CIA analyst now at the Heritage Foundation. That proximity would let them cause a lot of casualties and damage in the initial stages of an attack. Any conventional attack from the North would likely begin with an artillery barrage, which could include chemical weapons. “They would try to overwhelm US and Korean forces with volume,” he said. Any initial assault would face about 28,500 U.S. troops and about 600,000 troops in the South Korean armed forces. “In the war game simulations eventually we prevail, but it’s World War I (levels of) casualties,” Klingner said. 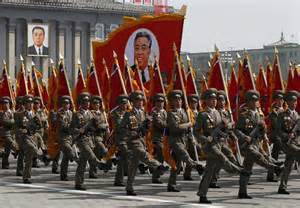 North Korea warned Seoul on Saturday that the Korean Peninsula had entered "a state of war". Still analysts say a full-scale conflict is extremely unlikely, noting that the Korean Peninsula has remained in a technical state of war for 60 years. But the North's continued threats toward Seoul and Washington, including a vow to launch a nuclear strike, have raised worries that a misjudgment between the sides could lead to a clash. In Washington, the White House said Saturday that the United States is taking seriously the new threats by North Korea but also noted Pyongyang's history of "bellicose rhetoric." North Korea's threats are seen as efforts to provoke the new government in Seoul, led by President Park Geun-hye, to change its policies toward Pyongyang, and to win diplomatic talks with Washington that could get it more aid. North Korea's moves are also seen as ways to build domestic unity as young leader Kim Jong Un strengthens his military credentials. Recently US military officials revealed that two B-2 stealth bombers dropped dummy munitions on an uninhabited South Korean island as part of annual defense drills that Pyongyang sees as rehearsals for invasion. Russia’s faintly sinister foreign minister, is not a man who panics easily. So it is worth paying attention, to what he has to say about North Korea. “The situation could simply get out of control, it is slipping toward the spiral of a vicious cycle,” was his comment yesterday. You could dismiss this as the usual Russian criticism of US foreign policy, since Lavrov was implicitly knocking the US military exercises that seem to have provoked North Korea’s most recent, blood-curdling threats. Or you could take what Lavrov has to say seriously. I’m inclined to do the latter. There are still far too many people in the West, who treat the threat of North Korea as a joke this could be a big mistake. Most North Korea watchers have traditionally urged the West not to take the regime’s wild language at face value – and have downplayed its military capabilities. But some are beginning to take a different line. It can be argued that North Korea is a lot more dangerous than some people think. Chris Hill, a former US diplomat with as much experience of dealing with the North as anyone, thinks that the threat of war by miscalculation is rising. Hill does not think the Kim regime wants a conflict with the US. But he also reckons that the sabre-rattling has reached a new and dangerous level – that could lead the North to provoke a broader conflict, by mistake. One of the potential problems is that both North and South Korea have new leaders. There is much speculation that Kim Jong Un is trying to prove his mettle to the North Korean generals. Meanwhile Park Geun-hye, the new South Korean president, is also under pressure to be tough. She is in political trouble at home. The South has threatened to respond to any new North Korean provocations – such as the sinking of a South Korean ship in 2010 in a much tougher fashion. So even if the North’s actions fall well short of anything nuclear, they could provoke an unexpectedly harsh response. The real problem is how best to resolve the issue before it becomes a full blown crisis. For years many "tough guy Americans" have seen the answer as to, just Nuke the bastards, but this is easier said then done and has some huge negitive ramifications. For years America has followed a strategy of hoping in time things would get better, that the people of North Korea would demand more goods and western style comforts and move towards freedom. When the last foul leader died officials hoped that North Korea's young leader would prove to be a reformer, instead lines have harden and cooperation has deteriorated. They are now increasingly worried that he might blunder his way into a war. Even as they publicly describe 30-year-old Kim Jong Un's recent bellicose threats as bluster, administration officials have stepped up visible demonstrations of American military power. Currently all signs coming out of North Korea are not constructive to a peaceful co-existence, it is possible that they have become so delusional and paranoid that there is no turning back. Caitlin Hayden, spokesperson of the National Security Council said "North Korea has a long history of bellicose rhetoric and threats and today's announcement follows that familiar pattern," she continued on saying that we take these threats seriously and remain in close contact with our South Korean Allies. Referring to the statement by defense secretary Chuck Hagel, Hayden said the US remains fully prepared and capable of protecting the country and its allies. "We continue to take additional measures against the North Korean threat, including our plan to increase the US ground-based interceptors and early warning and tracking radar, and the signing of the ROK-US counter-provocation plan." The White House statement came after Kim signed a plan on technical preparations of strategic rockets, ordering them to be "standby for fire so that they may strike any time the US mainland and its military bases, North Korea on Saturday said it was entering a "state of war" with South Korea and warned that US bases in Hawaii and Guam would be targeted in what could turn into "an all-out war, a nuclear war." North Korea's official news agency reported that after his meeting with his top commanders Kim Jong Un, said his country "would react to the US nuclear blackmail with a merciless nuclear attack, and war of aggression with an all-out war of justice." I have no knowledge of the motivation, or how crazy the average North Korean soldier might be. Several times in history the ink has only begun to dry on a peace accord before one of the participant attacks totally unprovoked, things are often hard to predict. Forthcoming events may well dictate and act as a blueprint to our future actions. We should not be downplaying this. It is possible we may be facing a watershed event that makes limited nuclear war commonplace, this situation highlights the difficulties of dealing with rouge nations. Let us in America and people throughout the world realize and internalize the potential for a million or more dead North Koreans and many of their neighbors to the south, this does make this situation dire indeed. I have always had a rough time getting excited about investing in Japan because of the unstable ground beneath the country, the problem did appear as an issue when the tsunami hit in march of 2011. A question may be arising recently as to the financial stability of the yen and the country's markets. Since the middle of November Prime Minister Shinzo Abe, then running for office, began a campaign to talk down the value of Japan’s currency to revive the nation’s export-led economy. Many finance ministers in developing economies from Russia to Thailand say the world is plunging into a currency war. This time around it’s not the U.S. that’s taking the heat, nor is it China, It’s Japan. The first deputy chairman of Russia’s central bank, warned on January 16th that “Japan is weakening the yen, and other countries may follow”. On January 22nd, the Bank of Japan set a new 2 percent annual inflation target and pledged to expand its purchases of bonds and other assets next year to reach its goal. Both moves are likely to weaken the yen further in the long run, thus other governments are more alarmed than before. Prime Minister Shinzo Abe is urging the Bank of Japan to buy foreign bonds for the purpose of lowering the yen’s value. An Abe adviser, told reporters on January 20th that policymakers are working hard to raise prices and create a little inflation within Japan and influence the yen. But, he added, “if it goes too far, it should be stopped.” As a way to drive the yen lower many different tricks have been used, remember you can always lower the value of your currency. Japan has bought over a half trillion dollars of US bonds and bad Euro debt over the last two weeks. A spokesman for German Chancellor Angela Merkel’s party said on January 22nd that Japan’s actions risked retaliation by other Group of 20 nations. Critics call it a, "beggar-thy-neighbor policy" because trade is a zero-sum game: If one country racks up bigger surpluses, another must run bigger deficits. Competitive devaluation is even blamed by some economists for contributing to the Great Depression. It’s popular to blame countries with falling currencies for hurting their neighbors, but the reality is more complex. Recently Ford CEO Alen Mulally said he’s concerned that the depreciation of the yen is bolstering the competitiveness of Japanese car makers. “The most important thing that most countries around the world believe in is letting the markets determine the currency,” Mulally said today from Bangkok in reference to the Japanese currency, during an interview on Bloomberg Television as stated, the yen has fallen about 15 percent against the dollar since mid-November. This has bolstered shares of Toyota and Honda Motor Co. as well as the Japanese market as a whole. The yen’s slide increases profit for Japanese automakers when they sell vehicles outside their home market, helping them to cut prices, boost advertising and improve products. The American Automotive Policy Council, backed by Ford, General Motors Co. and Chrysler Group LLC, estimates that the currency advantage equates to about $5,700 per vehicle, this is a huge advantage. FOOTNOTE; This article dovetails with a previous post about currency trading and dangers related to it. Germany as well as America have benefited from the deeper problems in other parts of the world. That means many view these two countries as better places to invest then a country "on the brink". This also means an increased probability that a bubble is occurring in these markets. I'm amazed how little attention is being given to this issue. America has seen the dollar strengthen as a result of money flows seeking a safe haven. While being far from trouble free and sitting pretty, America has been described as the least ugly house on the street. While I have heard concerns about the markets in America, little attention is being paid to cross border money flows inside of Europe and how this benefits Germany. In our shrinking and more crowded world where cross border investments have become more common, it does not take a rocket scientist to realize that Germany will fair better then its bankrupt neighbors if a melt down occurs. It would only follow that this would support and drive up values of Germany equities and bonds, on the flip side this also makes them more vulnerable to becoming overvalued. Why is this not being talked about more? The problems in Europe are both broad and deep. They will not be solved soon if at all and that means uncertainty and risk. If you invest in a foreign market that also sees its currency rise you get a double whammy. The downside is that it can create a bubble as more money rushes in and expands the move past what it would normally be, at some point it becomes unsustainable. Ask the bankers in Cyprus how much capital and money fled the country, then cast your eyes towards Slovenia, as a crisis approaches it is easy to predict the same, and yes, it is also easy to predict where much of it will go, yes, this helps explains the soaring German market. Footnote; The post below looks at how little has really been done in addressing the banking problem in Europe. Other related articles may be found in my blog archive, thanks for reading, your comments are encouraged. A Bad Haircut, seizing bank accounts! A bad haircut, in this case means you have been robbed. That may be the case if the government reaches in over a long weekend and steals money from your bank account. This is a horrible precedent to set, and the worst part may be how some people are letting it slip out that it would be fair, or in some way justifiable if it is only on the larger accounts. It is fine if it only impacts the savings of someone else, the savings of what they see as "the wealthy", the problem is someday they may come for you. I shudder to think what kind of world our children will live in. Words are being pulled from the playbook of George Orwell in order to cleanse and add the illusion of respectability and order to the filthy actions of those in power. Suddenly they are using words like levy, and bank deposit tax, anything other then "theft". These bank accounts were guaranteed, but not against this. We have come to the point where governments are now comfortable with seizing accounts under the flimsy and bogus excuses. When a default occurs, whether it be in bonds, or a large institution fails, clowns in suits with badges that say regulator or authority, decide how to change the rules. This should be viewed as a watershed event, we are entering into a new world where savings are far less safe. What we must fear is that, in a future financial crisis, retail depositors worried that some of their supposedly guaranteed accounts would be confiscated will stage bank runs, making the crisis worse. In Cyprus, the government declared a “bank holiday,” shutting banks to prevent massive withdrawals. It's the perfect irony that when the government screws up it then punishes the people who were prudent enough to have saved some money by stealing from them. Footnote; for more on the potential of a bank run and the Euro please read my post below. With what is now happening in Cyprus eyes are again focused on the banks in Europe. A bank is liquid when it has funds available to meet withdrawals, and this has no relation to the state of the banks balance sheet. A bank with loads of bad debts but highly liquid will survive a bank crisis. A bank with a pristine debt book but low liquidity may not. A banking regulatory authority needs far less money to maintain liquidity in a bank than shore up its balance sheet. A financial system can be maintained at very low cost, even in the midst of a financial crisis, if the regulatory authority concentrated on providing banks with a drip feed of liquidity and guarantees deposits, no big amounts of money are needed to survive. If the bank had a large number of bad debts it would not prosper, but that is the shareholders' problem. It does not affect the bank depositors, the bank users, or the economy as a whole. But the bank, given government liquidity support, and nothing else, could continue to operate. Big sums of money are not necessary, if the bank runs low in cash, draw that minimal amount from the central bank. Guarantee the bank's continued existence and no more is necessary. The US action of massive loans to the banks or taking over their bad debts was totally in denial of basic economic theory. These actions are distorting economies and creating bubbles everywhere. I have yet to hear anyone mention how money flowing into the safer German economy is creating a bubble there, but it is. Recent UK bank runs were different, people were not fleeing UK! They were simply withdrawing money from bankrupt banks, they were not transferring money to another country. In the EU, the recent use of the banks to purchase Eurobonds was misguided, and a misuse of the ECB's activities. Place the above concept front and center in your mind, a bank crisis can be averted with relatively small amounts of money. If the regulatory authority does not do the wrong thing and give the banks massive and unnecessary amounts of money. It need only supply a drip feed of liquidity and guarantees the deposits, no panic is necessary if the regulatory authorities know what to do. Given their current record however, that maybe is somewhat doubtful. The problem in Europe is that the Euro is structured to loosely, and based on economies unbound by "common" market forces. During the height of the Euro crisis shares in Bankia plummeted on reports, later denied, that customers were pulling deposits out of the Spanish lender. Fears of a full-scale bank run in Greece were talked about. The possibility of a deposit run in Europe's peripheral states is still very much alive. It is also the thing that policymakers are least prepared for. As with most aspects to the euro crisis, the usual answers are not much help. Old hands of emerging market bank runs piled cash up in full view of panicking customers so that they could see how well stocked the banks were with money. The equivalent now is to let the central bank provide enough liquidity that the ATMs always spit out cash. Problem is that the idea may be to get your hands on euros today in case of a surprise currency redenomination tomorrow, if that happens you will want Euros under your mattress. In this case a logical solution would be to set up a joint deposit-guarantee scheme, in which euro-zone states pool resources to provide credible reassurance that depositors across the zone will get their money back, up to a threshold of €100,000 ($125,000). The guarantee would have to be a promise to repay the original value of the deposit in euros. The problem is that even if the political will to realize this end existed (which is highly questionable), it would take a long time to negotiate an agreement. There are all sorts of details for Eurocrats to get their teeth into. Such as the cost and should the scheme be prefunded? Should depositors be preferred creditors, or behind the ECB in the queue? What supervisory arrangements are needed to ensure that creditor nations have sufficient oversight of the deposit-taking institutions they now insure in peripheral countries? And that is before you get into the rigmarole of ratifying agreements. The trouble with this is that there is a horrible, mismatch between the timescales to which Europe’s policymakers work and the timescale of a bank run. A run is usually occurs quickly, and if a run starts, Europe’s governments will have to reassure within a matter of hours. You might just about get a communiqué from Brussels in that time-frame, but could it really reassure when so many questions are unanswered? If it does not, then the run will continue until such time as the banks close their doors to further withdrawals or the central banks have satisfied depositors’ demand for cash. The former means trapping depositors inside a system they do not trust. The latter means providing liquidity to a banking system that has been abandoned by its own citizens. It would be hard to come back from either position. Some people think that a propaganda war has been launched against the euro to remove our attention from the disaster in the US and UK economies. Except for Germany most of Europe appears to be in denial as to what the real problem is, the banking crisis is just the tip of the iceberg. It is appearing first because the crisis manifested in financial and sovereign solvency crisis is being transmitted through the global financial markets. But deep down it is the post war nanny state entitlement culture of most of EU countries, supported by past dividends and borrowing. During that period they not only expanded their lifestyle and entitlements on borrowed money, those countries also lost their competitiveness on a wholesale basis through massively moving away from economic value adding activities. Austerity and economic contraction remains inevitable and the only feasible way to get the countries' books back to balance, and to get to the restarting point. Mr. Hollande and others like him are deluding themselves and their population through their socialist style spend and grow talks. They seem not to have realized that the old debt fueled consumption led growth model is dead, countries have borrowed money from the banks that they can never repay. This is what makes the Euro crisis a bank crisis, very specifically a City of London crisis. UK, German, and French banks lent massively to Greece. The banks secured their loans with CDS's written over London. Greece defaulted last year but the banks declared it hadn't defaulted, so they didn't need to pay up on the CDS's. Now if Greece formally defaults the City of London has a big problem as they cannot pay out on the insurance they sold. What would happen if Greece or another country defaults it a way that can no-longer be denied thus causing banks to default? Some people think the Chinese and the Germans (etc) would most likely move into buy the assets of the bust industries at huge discounts and value. Needless to say, the troubled banks prefer large amounts of capital supplied free of charge, they like it even better if the government takes their bad debts off the balance sheet a la TARP, but this is not necessary. Despite what you have been told, banks can continue to operate perfectly well, even with massive losses on their books. The government need only guarantee their day to day liquidity, and supplies a bit if necessary. This amount is vastly smaller than any repayment of losses or capital support, and what we know as a bailout.. These are "money games" with governments loaning to banks and in response banks supporting those governments by buying government bonds. It is a massive transfer of money, to the bankers from the tax payers. Governments do NOT need to "improve balance sheets". Banks can continue to operate with major losses on their books for years until they pay them off. Bad for shareholders, but not bad for depositors, bank users, or even the economy. It only means lean times for the bankers who would have to forgo huge salaries and bonuses as they worked their way out of the hole they put their institutions into. The response to runs and efforts to calm worries about the solvency of specific institutions by beefing up deposit guarantees in the first phase of the crisis, is what governments did. But that makes the problem worse, not better, if government solvency is at the root of the problem, and this time government solvency is indeed the problem. The generation that is now beginning to retire seems to have leverage its size into favorable policy that it will enjoy in later life. Governments slashed tax rates in the 1980s to revitalize their lagging economies just as boomers approached their prime earning years. The average federal tax rate for a median American household, including income and payroll taxes, dropped from more than 18% in 1981 to just over 11% in 2011. This means less revenue for the generous benefits boomers have continued to vote themselves, programs like a prescription-drug benefit paired with inadequate premiums have caused deficits to explode. An American born in 1945 can expect nearly $2.2m in lifetime net transfers from the "state" far more than they pay in, and far more than any previous group. A study by the International Monetary Fund in 2011 compared the tax bills of what different age citizens pay over their lifetime with the value of the benefits that they are forecast to receive. The boomers are leaving a huge bill. Those aged 65 in 2010 may receive $333 billion more in benefits than they pay in taxes. This is an obligation to the government, 17 times larger than that likely to be left by those aged 25, this is a huge burden that the young is about to inherit. Sadly, arithmetic leaves few ways out of the mess, the numbers are ugly and much of it is only now becoming visible in our soaring National Debt. Faster growth would help, but the debt left by the boomers adds to the drag of slower labour-force growth. Carmen Reinhart and Kenneth Rogoff, two Harvard economists, estimate that public debt above 90% of GDP can reduce average growth rates by more than 1%. Meanwhile, the boomer era has seen falling levels of public investment in America. Annual spending on infrastructure as a share of GDP dropped from more than 3% in the early 1960s to roughly 1% in 2007. Austerity is another option, but the consolidation needed would be large. The IMF estimates that fixing America’s fiscal imbalance would require a 35% cut in all transfer payments and a 35% rise in all taxes—too big a pill for a creaky political system to swallow. Fiscal imbalances rise with the share of population over 65 and with partisan gridlock, this is troubling news for America, where the over-65 share of the voting-age population will rise from 17% now to 26% in 2030. As this voting block grows and strengthens it is unlikely they will loosen the noose. Recently an article on BBC news said the weakness in the labor market and in the UK economy is on the pay side and that people are having to price themselves into jobs. This means that there continues to be a cut in the real value of pay as inflation remains higher than pay increases. People have now taken an average cut in pay over recent years and today we see there's still more than five people chasing every job vacancy. Youth unemployment has risen, many jobs are only part time, and long-term unemployment is still far too high. I contend the same is happening in America. While many people think that the recent jobs report was great, it should be noted that these reports are complex and not always accurate. Remember, Obamacare was recently put in play, under Obamacare, the definition of full-time employment is 30 hours. The Bureau of Labor Statistics cutoff is 34 hours. At 30 hours, companies have to pay medical benefits so they have been slashing the number of hours people work. The reduction in hours people are allowed to work by companies is providing an incentive for many workers to take on an extra job. We can see the effect in actual BLS data. After declining for years, the percentage of those working two or more jobs is again on the rise. In the past month there was a surge of 679,000 in the number of people working multiple jobs. The participation rate is currently 63.5%, down from 66.2% at the beginning of the recession, matching a 31-year low. If the participation rate were still at 66.2%, the unemployment rate would be 12.1%. This may be a reflection of the fact that we continue to see larger businesses fare better then the small shops on main street. Another troubling sign is that the increase in U.S. productivity in the first quarter was a bit lower than initially thought and hourly compensation for American workers posted a huge decline according to newly revised government figures. Hourly compensation plunged 3.8% in the first quarter instead of rising 1.2% as initially reported. That's the biggest decline since the Labor Department began keeping track in 1947, with the largest drop occurring in the manufacturing sector. This bodes poorly for our consumer driven economy. A Gallup survey on jobs released Thursday shows the percentage of workers working part time but wanting full-time work was 10.1% in February, an increase from 9.6% in January and the highest rate measured since January 2012. Gallup notes "Although fewer people are unemployed now than a year ago, they are not migrating to full-time jobs for an employer. In fact, fewer Americans are working full-time for an employer than were doing so a year ago, and more Americans are working part time, all indications are that this is not by choice. Footnote; a recent post that received a lot of attention focused on the problem of creating "real jobs", current policies do not reinforce or promote this trend. One reason the euro holds together is fear of financial and economic chaos on an unprecedented scale, another is the impulse to defend the decades-long political investment in the European project. Today we continue to see the parties involved say that they remain committed to propping up nations like Greece. Its departure from the euro, Angela Merkel, Germany’s chancellor recently stated, would be “catastrophic”. Yet, Mrs Merkel is not ready to take the action needed to save the euro once and for all. This means that the euro zone remains vulnerable to new shocks. Markets still worry about the risk of sovereign defaults, unsustainable deficit spending, and of a partial or total collapse of the euro. It is possible that the currency is built on a unstable foundation so flawed that it can't continue. Common sense suggests that leaders should think about how to manage a break-up. Some may be doing so, but having described a split as bringing economic Armageddon, leaders dare not be seen planning for it. Like Greece, the austerity-wracked economy of Portugal is expected to muddle forward. Economists remain skeptical that growth will pick up in 2013, as the government forecasts. The government's austerity measures and labor reforms in Portugal will cause many workers to see their wages drop by up to 25%. On top of pay cuts and tax increases, the measures will make it easier and cheaper for companies to fire workers, will introduce more flexible timetables, and will cut holidays and overtime rates. Mr Carlos who is a member of the central committee of Portugal’s hardline Communist Party recently said, “I don’t believe that workers will passively accept a cut in pay”. If not be prepared to continue seeing this play out on the streets of that troubled nation. The problems are many, and the economic problems facing the Euro-zone are big, the other thing that is for sure, is that they are not going away. News that billionaire John Paulson, a lifelong resident of New York is exploring a move to Puerto Rico has set off alarms in many circles. It also got me thinking, this dovetails with my thoughts that we are seeing emerge a new class of "world citizen". His move would be in reaction to a new law in Puerto Rico that would eliminate taxes on gains from the $9.5 billion he has invested in his own hedge funds, according to people who have spoken to him about a possible relocation. Paulson, 57, recently looked at real estate in the exclusive Condado neighborhood of San Juan, where an 8,379- square-foot penthouse, complete with six underground parking spaces, lists for $5 million.Ten wealthy Americans have already taken advantage of the year-old Puerto Rican law that lets new residents pay no local or U.S. federal taxes on capital gains, according to Alberto Baco Bague, Secretary of Economic Development and Commerce of Puerto Rico. The marginal tax rate for affluent New Yorkers can exceed 50 percent. This story is newsworthy on two notes. One it shows how the wealthy, and people in general will shift or move away from areas that have policies they consider harsh to their existence or generally unfriendly, the other reason it should be noted is that it puts the spotlight on the difference between mere "working millionaires" and billionaires. When you have a lot of money and are massively wealthy you gain the ability to go where you are appreciated. People react faster and smarter then governments, expect the world to take note and respond accordingly. 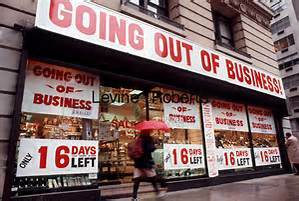 Small business failures should receive a lot more attention than they do, we will see a lot of these in the near future as people have started down this path when unable to find a job. Small business is hard, going into business is risky, and many people are not up to the task. As a property owner that leases space to many start-ups, I have a keen interest and knowledge of the microeconomics that occur. Just as important is the effect, long and short term on the economy. With most business start-ups having a very short lifespan of just months or around a year, the short-term burst of spending is quickly followed by the longer term negatives. Formation of new businesses is very important to America and the economy, but a dark side does exist. The study of the anatomy of a failed business can be very enlightening. When a new business opens or is formed generally a fair amount of money is spent or invested, this often comes from the savings or loans from the owner, their family or close friends. This stimulates the general economy. Money spent on fixtures, leasehold improvements, services, and inventory help create jobs, but a dark side exists to this entrepreneurial adventure and that is when the business fails to achieve economic success people often get hurt. I'm not talking about hut feelings and or even just feeling sad, I'm talking serious pain of a financial nature. Contracts go unfulfilled, bills are not paid. Suppliers must take write-offs, and landlords after only a few months rent and more months that are never paid, usually get back buildings negatively altered, by unsophisticated novices doing shoddy work. Utility bills go unpaid and must be written off, those who have sold services never collect yet suffer the upfront cost and investment. The fixtures and inventory of these failed enterprises often sold at a discount or trashed become underutilized, or dampen a competitor's future sales. And last but not least, let us return to the psychological damage that follows in the wake of a business failure. This often turns into shame as they dodge those they let down, and is often followed by bankruptcy, destruction of credit, broken families, divorce, loss of one's home. An entrepreneur who fails often sees years of hard work and all or most of their retirement savings vanishing into the land of broken dreams. In the end, the taxpayer and government may end up supporting those who fail when they retire early or need medical help, and that is a cost and negative many forget. Long hours of hard work and sacrifice is only part of the demands and burdens asked by today's entrepreneurs. Footnote; This is not the first article I have written on the state of small business in America. I posted in January 2012 a piece about how few Americans really go down this difficult path, it was titled, "Only A Few Are Entrepreneurs"
Ten things that a truthful Ben Bernanke should say to clarify where our economy is, and where it is going became crystal clear as the Federal Reserve Chairman Ben Bernanke reaffirmed the central bank's commitment to its massive stimulus program recently while testifying before the Senate banking committee. He tamped down speculation of a pullback that spooked stock markets last week and touted the benefits of the Fed's efforts to keep interest rates near zero. The likeable and reassuring media figure engaged us with the idea that he had our back and would lead us forward. Bernanke stated that sales of homes, autos and other durable goods have rebounded and that has helped reduce unemployment and build household wealth. This in turn has fueled the engine of the economy: consumer spending. He promised that the Fed would keep its easy-money policies in place "as long as needed." But critics of the central bank's policies, including some Fed officials, have warned that years of ultra-low interest rates and the Fed's monthly purchase of billions of dollars in bonds may lead to serious unintended consequences, such as inflation, massive distortion in the value of assets, and bubbles. 1 Fed policies are hurting those that did the right thing and saved. They are now seeing their wealth and savings erode by inflation. The impact is and will be incredible, we are seeing years of hard work and savings being washed away. How will pension funds be able to pay out as promised billions of dollars when they are earning little or nothing on what they invest. 3 Bubbles are being formed, values need to make sense, investments that may work at the low interest rates today may become a problem when rates begin to rise, locking your money into any long term investment may become a disaster. Values need to be closely questioned, he would caution people from moving their money into more risky assets. 4 He would have sounded an alarm to continuing a massive government deficit spending policy, and ever larger government, and talked about how this has artificially propped up GDP. At the same time cautioning and urging that we begin to ween ourselves off of this crutch sooner rather then later. 5 He would tell the President and Congress much of the blame for what happens in the future will rest directly upon them. He would hammer them to address the financial crisis forming before us and to reform entitlement spending. He would urge Washington to look at the math and numbers. 6 Bernanke would of pointed at how we have done nothing to reform our tax system, and that we need to simplify our tax system in a revenue neutral way as to cause capital to be invested wiser and promote growth. How ending silly loopholes and lowering corporate rates would bring back jobs from overseas. 7 He would of talked about taking the structural changes necessary for creating jobs in a mature economy and in a world where they are highly valued. He would of talked about how this dovetails with the need for long term sustainable growth and the need for Washington to step up to the plate and fulfill their responsibilities to the country. 8 He would have talked about how devastating a bond market collapse would be, and how "forced" higher interest rates would dramatically change our lives and effect the nations security. How the impact of high government deficits coupled with trade deficits is a recipe for disaster. Economic strength is as important as military strength, and you cannot have the later without the former. 9 The Fed Chairman would of defended the young and unborn who will bear the cost of our sins. The unsustainable transfer of wealth from the younger generations to the baby boomers and older cannot continue to increase. How it will end badly, by promises being broken when the burden become to large. 10 And last but not least Bernanke would of cautioned that not only America, but much of the world is trying to transfer off responsibility through currency manipulation, and that this can escalate into a currency or trade war. All of the above effect the value of the dollar, and without action the future of the dollar as the world's reserve currency is at stake. Yes, it is a shame he did not say these things. If he had, in effect he would of said what needs to be said. Instead he choose to double down on the bet he has made. Bernanke who has been called a "student of the Great Depression" because of the time he has spent researching the subject, has forgotten that we emerged from the long and hard economic malaise only by entering a World War. Thus he continues taking us down the rabbit hole and on a journey to prove that if we just continue doing what is not working, all will turn out fine. Caution, this path leads down, and down, and down, farther and deeper then most can ever imagine. Not so long ago Moody's Investors Service lowered ratings on Italy, Portugal, Slovakia, Slovenia and Malta by one notch and slashed Spain's sovereign rating by two notches. The ratings agency also cut the outlook on France, the United Kingdom and Austria. The moves reflect the susceptibility of the countries to the growing financial and macroeconomic risks emanating from the euro-area crisis and how these risks exacerbate the affected countries' own specific challenges. We must wonder how soon America will trigger a down-grade considering the recently proposes budget. The 1.5 trillion dollar deficit America has ran each of the last several years means spending on every man woman and child in America, over 4,500 dollars more then the government takes in. It is around a general view or group of expectations that financial markets and economic actors build their bets. Financial markets may react to a this "stimulus" by behaving ever more dangerously, until some shock triggers an epic collapse. This is different from a world in which financial markets assume that macroeconomic stabilization policy is sophisticated enough to prevent big nominal swings in the economy, and when the central bank allows or enables a big drop in nominal output everyone is caught off guard. There is a subtle difference between crises associated with the financial-market and those associated with central-bank incompetence. The two may go together, but that doesn't mean they're equivalent events or that attempting macroeconomic stabilization is a bad idea. Governments and their central banks can't suppress all volatility, just the nominal swings. Real shocks may still upset financial apple carts, providing the needed market messiness. We can look again at 2008 for an example. It seems probable that the oil price spike of the first half of 2008 was destined to induce a recession. An aggressive central bank might have succeeded in keeping nominal output growth relatively stable, but inflation was likely to rise and real output decline in that scenario, based solely on the supply shock. I suspect that kind of recession was more than enough to topple vulnerable financial institutions and clear out a lot of financial brush. It needn't have implied a near-Depression, however. Macroeconomic stabilization is consistent with healthy volatility; real shocks can be perfectly good at trimming back over-aggressive financial actors. It's a mistake to think that a deep, demand-side recession is the only thing that will do where financial-market discipline is concerned. It must be noted that: suppression of macroeconomic volatility isn't as big a problem for financial markets as is the "moral hazard" of interfering and manipulating markets. I'm not sure that the relatively smooth macroeconomic performance of the last 30 years was as big a contributor to financial-market vulnerability as was the practice of stepping in to bail-out key creditors. I'm currently working my way through the New York Times bestseller The Black Swan. In the book Nassim Taleb makes it clear that we never have a clue from where the next unexpected shock will hit our world. A guest on a television financial show put forth an interesting and seldom talked about theory, he thought emerging market were the Achilles heel that would bring about our next crash. These markets have done very badly so far this year, yet people have left their money in them as a long term investment. Emerging markets hold a large amount of investors wealth, if they continue to drop because of risk, and if people would stampede to get out it would be devastating. Our investment world is built on a foundation of faith and trust, if that begins to crack or crumble, real problems quickly form. People quickly forget how an economy grinds to a halt when suppliers or factories refuse to ship without securing "payment up-front". Unfortunately much of what we see and are told is a lie, and that is a fact, remember MF Global and Enron. If a market move occurs fast, most investors can not react and are left holding the bag at the bottom, these same investors then act as a roadblock to a market rebounding. If they loose faith and become disillusioned they often dump their stock over a period of years and at the sign of any rally. The financial crisis that began in 2007 also seems to indicate a fundamental flaw at the heart of the consumer society, the flaw being its emphasis on debt-propelled retail therapy. One of the most remarkable features of the modern economy is that interest rates are negative in real terms and are expected to remain so. This is not unprecedented. Real rates were negative after the second world war and again in the 1970s. But in both cases, inflation was much higher than it is today. Headline inflation rates are now falling because of the slow economy and lack of demand. With short rates close to zero, real rates will stay negative. As for long-term rates, government-bond yields are below 2%, the three relevant central banks are targeting an inflation rate of 2%. Looking forward most bond investors now expect to lose money in real terms. When an economy is growing rapidly, there is generally an abundance of profitable investment opportunities and businesses are happy to borrow at high real rates. In a sense, then, the level of real interest rates sets a hurdle by which profitable projects should be judged. If the rate is held at an artificially low level for too long, a big danger is that capital may be misallocated and flow into speculative investments. A recent report from the Bank for International Settlements points to a number of other problems that negative real rates can cause such as tempting borrowers into ignoring their balance-sheet problems. The result could be that the problems are left to fester, making it more difficult for central banks to raise interest rates in the future. Banks may also become too optimistic about the ability of borrowers to repay, and have failed to make adequate provisions for bad debts. And the easy money that banks can make by borrowing short-term from the central bank and lending long-term to the government is a public subsidy that screams foul! Pension liabilities are linked to bond yields. As yields fall, the present value of future liabilities rises, this creates huge deficits for pension funds in future years. Low interest rates in the developed world may have had spillover effects in emerging markets, pushing up exchange rates, increasing speculation and causing asset bubbles (such as Chinese property) and, until recently, inflating commodity prices. We must keep in mind that when rates do eventually rise we will most likely see a painful unwinding of these investments. Savers are suffering from these low interest rates.The leading edge of the massive Boomer generation knows that every dollar spent is a dollar it cannot re-earn or replenish. The logical thing to do is hoard their wealth. Boomers have little choice but to, keep the car for an extra 50,000 miles, cancel remodeling projects, and make the grand-kids fund their own education. With less interest income they are purchasing a lot fewer electronic gadgets and spending vacations in the backyard. Tens of millions of Americans are either in this position now or about to become so. The '60s created a generation of hedonists that changed the mores of the nation. The early 21st century is creating a generation of misers that will change the spending habits of the country, as a result of these low interest rates this "recovery" may be greatly delayed. Horse meat mixed with beef was first found last month in Ireland, then Britain, and has now expanded steadily across the Continent. The situation in Europe has created unease among American consumers over whether horse meat might also find its way into the food supply in the United States. 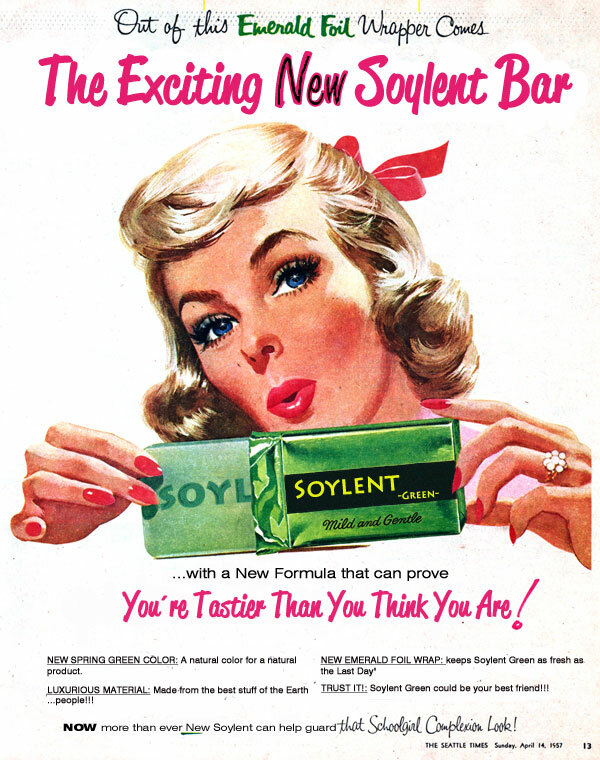 How good is your memory, or how far back do your reference points go, do you remember Soylent Green? Soylent Green is the name of an American science fiction film made in 1973 starring Charlton Heston. The film overlays the police procedural and science fiction genres as it depicts the investigation into the murder of a wealthy businessman in a failed utopian future. We see a world suffering from pollution, overpopulation, depleted resources, poverty, dying oceans, and a hot climate caused by greenhouse effect. 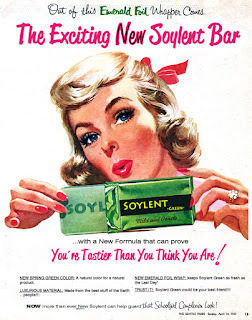 Much of the population in this future world survives on processed food rations, including one named "soylent green". Heston plays the part of detective Robert Thorn who disobeys orders and investigates the Soylent Corporation. Detective Thorn discovers that Soylent's oceanographic reports are fraudulent and that the oceans no longer produce the plankton from which Soylent Green is reputedly made. Detective Thorn sneaks aboard a garbage truck to a human body disposal-center, where he sees human corpses converted into the "food stuff" Soylent Green. Thorn then retreats into a cathedral filled with homeless people, where he is attacked by agents from the Soylent corporation and is seriously injured. When the police arrive, the dying Thorn urges those around him to spread the word that "Soylent Green is people!". Yes, he had discovered the processed food ration we were eating was made from human remains. This should not be interpreted as a plea for more government, but as concern about overpopulation and the damage being done to our environment. That being said, bottom-line is that it is hard to know what is in our food. I'm aware that we have inspectors, but for fun, and to stretch your imagination, think about a distant future at a time that food is scarce. In such a situation we might not look as closely or ask as many questions. I could go on but, sometimes writing less is more.